When accompanying a group of US high school students to Berlin, the disappointment was almost palpable. We were in Berlin and they wanted to see the remnants of the wall. Instead, we showed them a brick trail leading past Brandenburger Gate. Yes, there’s a small part of the wall preserved as an exhibit that you can view from an old guard tower. We did that. But it wasn’t up close and personal. Let’s face it. The Marble Kids Museum in Raleigh, NC had a chunk of the wall that seemed bigger than we could find in Berlin. Witnessing something outside a museum, a monument or an exhibit – those are life’s real treasures — and reminders that we live in a present shaped by our past. Like the tale of Napoleon and the Last Supper in the Church of the Minorities – no plaque explaining its origin – the wheres and whys and wherefores — just existing without fanfare brimming with tales untold. 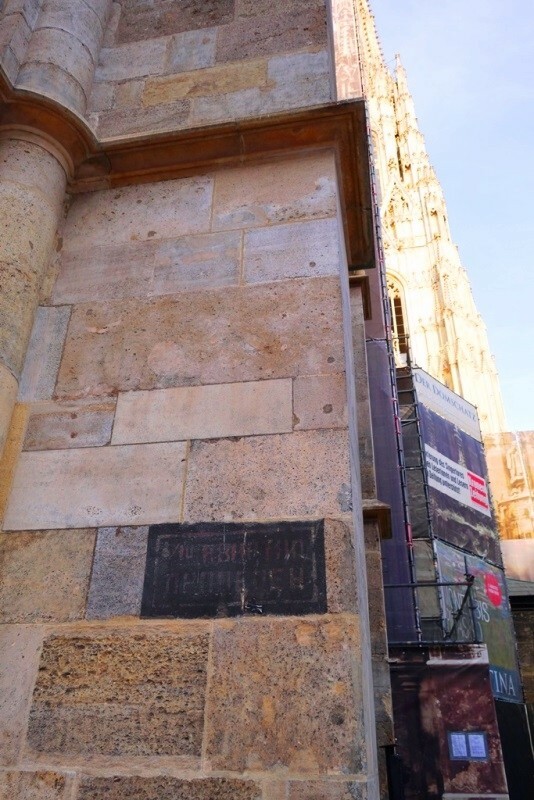 But sometimes, like in Berlin in November in 1989, in their eagerness to tear down the past, people will destroy all the physical relics associated with that part of history. And it’s exactly these real-life memorials that bear witness to what actually happened and stand to remind future generations that this wasn’t just a story in a dusty heavy book lectured from in a stifling neon-lit classroom, this was real. This actually happened. I’m here to prove it. Look at me! Touch me! Feel me! I’m real! Here’s proof! Testimony! Stroll through Vienna’s 1st district and you’re bound to pass countless such historical tokens silently safeguarding a snapshot of the city’s colorful and often times turbulent past. Ask any stray American college student backpacking through Europe about Berlin and they’ll hopefully be able to expound on the details of an occupied city following WWII on into the Cold War. Ask about Vienna, though, and I doubt their history lesson got so far as to mention that other city that was occupied and divided into four parts quicker than college students divvying up the Friday night pizza though the occupation was no historical hiccup — it lasted 10 full years. The Allied Forces divided up all of Austria after WWII into zones of occupations and all four Allied Powers (USA, UK, USSR, FR) shared control of Vienna, dividing the city up by districts and sharing control of the first. 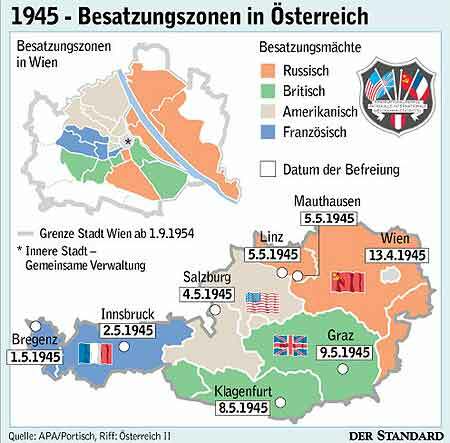 Here is a link to a map showing the the division of Vienna and Austria after WWII: Post WWII Occupation Zones of Vienna and Austria. 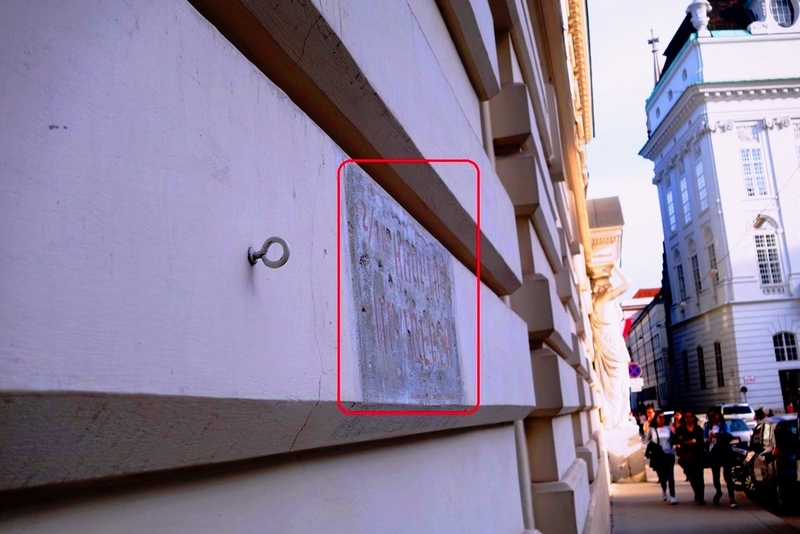 Recently I had the good fortune of encountering an inconspicuous reminder of the beginning of this time in Vienna history- not just one but two. Since I don’t speak Russia, or read Cyrillic, I could have probably passed the signs a hundred times in blissful ignorance more focused on the flavors of my ice-cream (What’s the difference between Kirsch and Obers-Kirsch?) than history patiently waiting to be noticed. “This quarter checked.” That’s what I’m told they read. They could in fact be soldier graffiti lamenting, “This city needs more vodka” or threatening “Ammies stay off of my turf” but I trust my information source. These two plaques are the leftovers (or newly made visible?) of hundreds that once existed throughout the city, inscribed on the corners of houses, buildings and churches throughout the city. 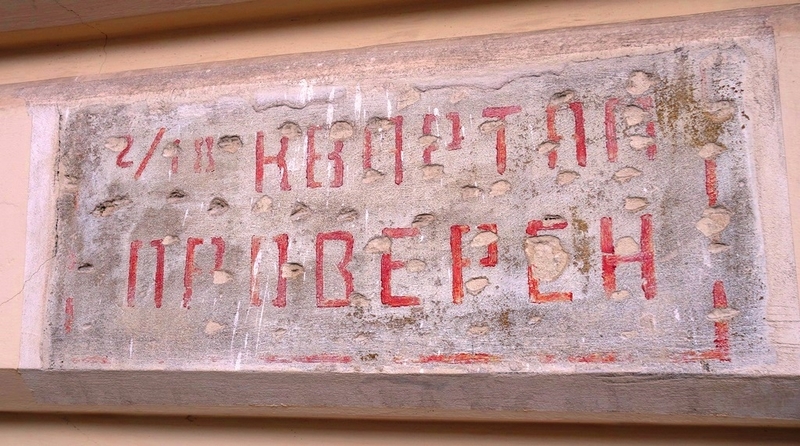 In April 1945 as Russian soldiers advanced house by house, street by street, neighborhood by neighborhood, district by district, clearing Vienna of Nazi soldiers, they wrote on the walls to let the other soldiers know that all was clear. You’ll find one at Josefsplatz near the Hofburg (near the Lipizzaner stalls) and another on St. Stephans Cathedral on the right corner of the church if you are facing the entrance doors. You’ll see a nondescript rectangle about 6 feet off the ground, recently laid bare again in the midst of renovation work, standing silent as camera flashing tourists rush past to the next glossy-brochure worthy historic landmark on their agenda.